Mark Pendergrast. City on the Verge: Atlanta and the Fight for America’s Urban Future. New York: Basic Books, 2017. 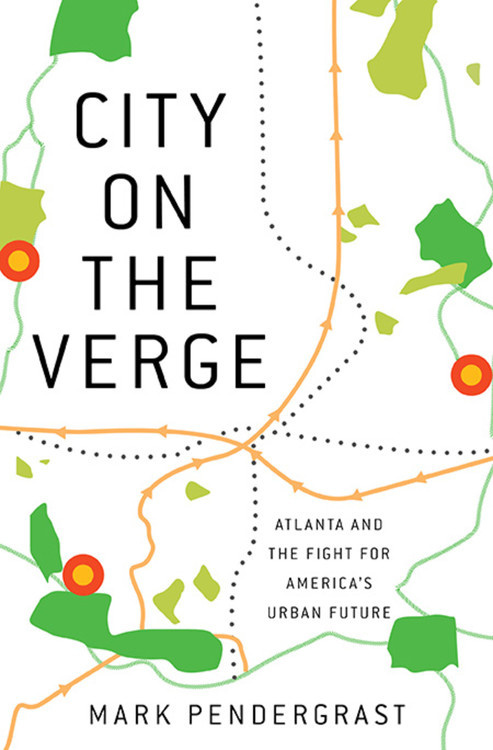 In the opening lines of City on the Verge, Mark Pendergrast admits what most locals know too well: Atlanta, with its runaway commutes, stubborn inequality, and uneven development, stands “at the center of a perfect storm of failed American urban policies” (ix). White flight hollowed its core, urban renewal swept away its neighborhoods, and highways have tied it up in knots. It‘s a lot like other American cities in these respects, he suggests, only worse. But just as other cities have reversed course in recent years, so, too, has Atlanta. It’s welcomed new residents, enlarged its tax base, and, if present trends continue, could well triple its population in a mere matter of decades. In order to accommodate so many new residents, the city must embrace “fundamental change” by supporting transit and smarter growth strategies. “Atlanta cannot afford to wait any longer,” Pendergrast warns, “Nor can the country” (ix). Its more expansive subtitle notwithstanding, the book’s primary concern is the Atlanta BeltLine, the twenty-two mile rails-to-trails effort that The Atlantic named, “the country’s most ambitious smart growth project.” 1 In fact, save for a single chapter in which he ventures outside the perimeter, the larger metro area receives relatively little attention and national perspectives less still. Nevertheless, City on the Verge is, at its best, a model of shoe leather reporting. Pendergrast has talked with, and often hiked beside, each of the project’s principal players, and he guides readers on a tour of the BeltLine’s history, exploring every twist and turn in the project’s still-winding path. To be sure, few developments in the city’s history have been the subject of such sustained interest. But Pendergrast’s telling is rendered in such detail that even those readers who have followed the project with interest will be rewarded. As even casual observers will know, Ryan Gravel looms large in the BeltLine’s emerging mythology. As well he should. It was Gravel’s Georgia Tech master’s thesis that set the project on its current course. But as Pendergrast shows, Gravel’s proposal was not entirely new. Elements of his vision can be found in plans dating back to the 1960s, when MARTA’s initial proposal called for transit along portions of what is now the Eastside Trail. 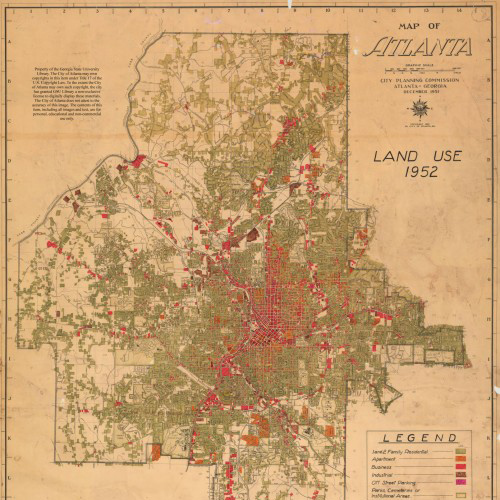 In the decades that followed, the Rails to Trails Conservancy, PATH, and CODA (the City of Atlanta’s Olympic-era redevelopment agency) would propose variations on the theme, but all were scuttled for one reason or another. Gravel’s thesis might well have met the same fate, but for the early support it received from then city councilmember and current mayoral hopeful, Cathy Woolard. Support from Ed McBrayer of PATH and opinion leader Maria Saporta followed, and in 2004, after winning the blessing of Mayor Shirley Franklin, the BeltLine was included in Mobility 2030, a Regional Transportation Plan prepared by the Atlanta Regional Commission. After three years of sustained advocacy by Gravel and a plucky band of grassroots activists, the BeltLine had come to exist, if only on paper. Before the Beltline. Photo by Flickr user ciambellina. CC BY-ND 2.0. The Mason affair was among the first public debates to determine what would get built along the BeltLine. Far more vexing, however, is the matter of who gets to live there. As a tax allocation district, the BeltLine has a legal mandate to promote affordable housing, and in the project’s early stages, leaders pledged to create 5,600 such units over a twenty-five year period – a task that, like so much else, was made more difficult by the recession. 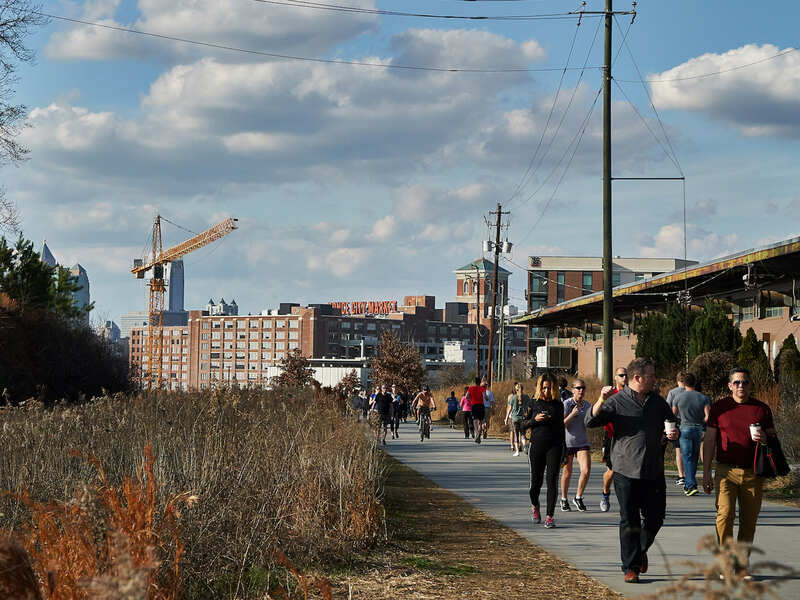 In fact, during its first ten years on the books, the BeltLine managed to meet just 10 percent of its goal, causing many observers to question the organization’s commitment to the cause. One such critic is Ryan Gravel himself, who, in 2016, resigned from the board of the Atlanta BeltLine Partnership in protest.3 In the months since Gravel’s departure, the BeltLine’s affordable housing program has come under increased scrutiny, and reporters at the Atlanta Journal-Constitution recently took the organization to task for failing to meet its commitments.4 Recent budgets now include increased spending for affordable housing and city leaders have meanwhile created an inclusionary zoning overlay for the district, imposing new requirements on developers who do business along the BeltLine. But with land values rising so quickly, Pendergrast makes clear that supporters of affordable housing are in a race against time, and whether or not the project’s targets will be met is anybody’s guess. At stake in the matter is not whether the BeltLine will promote gentrification, but whether it can also be a tool for social equity. That same calculus applies to another thorny topic: whether and when the BeltLine should accommodate transit. Since its inception, transit of one form or another has been a primary feature of the project and officials remain committed to laying down track. In fact, the Eastside and Westside trails have been constructed to accommodate future rail lines, a decision that helps account for their terrific expense. But Georgia Tech professor and former city planning commissioner Mike Dobbins remains unconvinced. With so few employment centers along the route, he reasons, potential ridership simply doesn’t justify the expense. For his part, Pendergrast agrees with PATH’s Ed McBrayer, who favors splitting the difference. Pave the trails quickly, they say, and make adjustments as necessary to accommodate transit down the road. Otherwise, the project risks becoming a “crowded recreational path for the upper class” (282). As Pendergrast suggests, other questions remain unanswered, too. 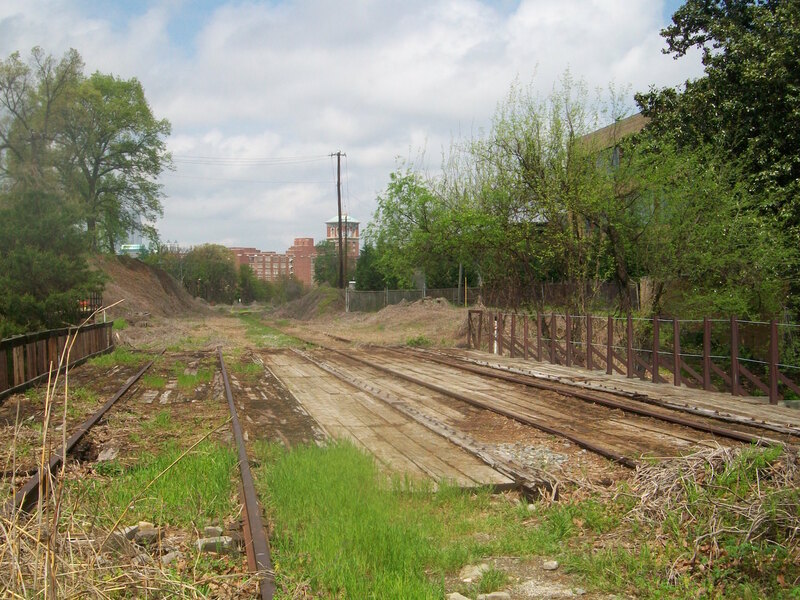 How will the BeltLine navigate the Hulsey Rail yard and other obstacles in its path? Will the fences around the Atlanta Water Works finally come down, as the author prefers? And most importantly, when will the BeltLine be completed? Progress proceeded slowly in the early going, largely due to financial limitations precipitated by the recession. 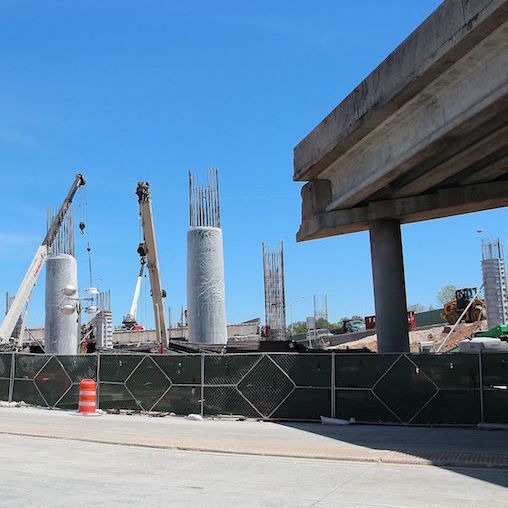 But with the passage of last year’s T-SPLOST and MARTA ballot referenda, additional funds should soon become available, and BeltLine officials now predict their work will be completed on schedule. A book about Atlanta first and foremost, City on the Verge nevertheless shares much in common with other recent works heralding a new day for the nation’s cities.5 As urban growth rates have reversed their downward trend, urbanists of various stripes have observed that an urban renaissance may be at hand. 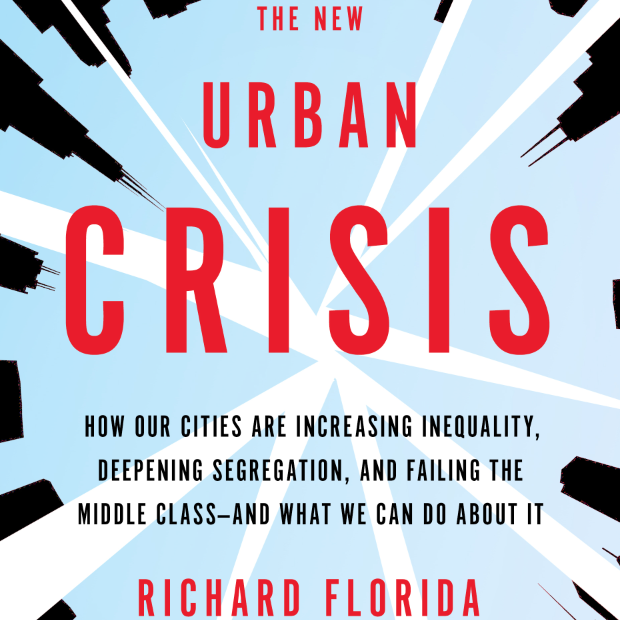 And Penderast’s suggestion that Atlanta may be on the verge of a brighter, more urban future, certainly has implications for cities nationwide. After all, “if it can happen in Atlanta,” he concludes, “it can happen anywhere” (267). It’s a contention that begs a comparison to claims made by Christopher Leinberger, whose 2013 study of Atlanta real estate trends predicted an end to sprawl.6 These and similar works have contributed much to our understanding contemporary urban issues, of course, but it may be that a measure of caution is in order. As the economist Jed Kolko recently observed, cities are welcoming ever greater numbers of residents, but “the prevailing pattern is growing out, not up.” 7 Rates of development in the nation’s suburbs continue to outpace those in its cities in all but a handful of cases, and Atlanta is not among their number. And so, while our city is likely to undergo a radical redevelopment in the decades to come, our metropolitan community is likely to remain much as it is today: vast, sprawling, and chaotic. Ultimately, Kolko’s analysis suggests an important point about the BeltLine, especially in an election season when candidates are citing their support for the project as evidence of a more enlightened urbanism: getting it right is not enough. And that’s true even if, like Pendergrast, we confine our focus to the central city. Part of what makes the BeltLine so compelling is that it addresses so many of our shortcomings as a community – our wide disparities in wealth, our lack of green space, and our stifling mobility crisis, among others. And because it links some forty-five different neighborhoods, it promises change on a significant scale. But other parts of the city will require affordable housing, parks, and transit, too, and however reasonable our excitement to see the BeltLine completed may be, we should be careful not to repeat earlier chapters in the city’s history, when we lavished attention on big projects, only to lose sight of the bigger picture. 1. ↵ Kaid Benfield, “The Country’s Most Ambitious Smart Growth Project,” The Atlantic, July 26, 2011, https://www.theatlantic.com/national/archive/2011/07/the-countrys-most-ambitious-smart-growth-project/242549/. 2. ↵ According to Pendergrast, the tentative deal negotiated between the Trust for Public Land and Mason was scuttled when Terri Montague, then-president of the Atlanta BeltLine, Inc., insisted on negotiating the deal herself (95). 3. ↵ Maria Saporta, “Ryan Gravel and Nathaniel Smith resign from BeltLine Partnership over equity concerns,” Saporta Report, September 26, 2016, http://saportareport.com/ryan-gravel-nathaniel-smith-resign-beltline-partnership-board-equity-concerns/. 4. ↵ Willoughby Mariano, Lindsey Conway, and Anastaciah Ondieki, “How the Atlanta Beltline broke its promise on affordable housing,” Atlanta Journal-Constitution, July 13, 2017, http://www.myajc.com/news/local/how-the-atlanta-beltline-broke-its-promise-affordable-housing/0VXnu1BlYC0IbA9U4u2CEM/. 5. ↵ William H. Frey, “Demographic Reversal: Cities Thrive, Suburbs Sputter,” Brookings Institution, June 29, 2012, https://www.brookings.edu/opinions/demographic-reversal-cities-thrive-suburbs-sputter/; Samuel I. Schwartz, Street Smart: The Rise of Cities and the Fall of Cars (New York: Public Affairs, 2015). 6. ↵ Christopher B. Leinberger and Mason Austin, “The WalkUp Wake-UP Call: Atlanta,” The George Washington University, School of Business, http://www.chrisleinberger.com/docs/By_CL/CREUA_WalkUP-Atlanta-2013.pdf. 7. ↵ Jed Kolko, “Seattle Climbs But Austin Sprawls: The Myth of the Return to Cities,” New York Times, May 22, 2017, https://www.nytimes.com/2017/05/22/upshot/seattle-climbs-but-austin-sprawls-the-myth-of-the-return-to-cities.html?_r=0.